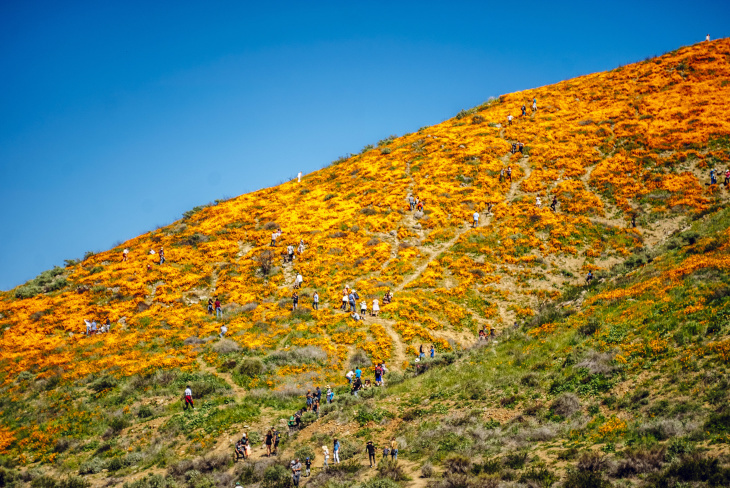 This week in Why We Can't Have Nice Things: a popular spot for viewing the super bloom was closed because the horde of flower-gazers that descended on Lake Elsinore over the weekend caused a "poppy nightmare," according to city officials. Then on Monday, city officials reopened Walker Canyon, saying it was "not feasible for us to keep visitors away," though they noted access and parking were limited. 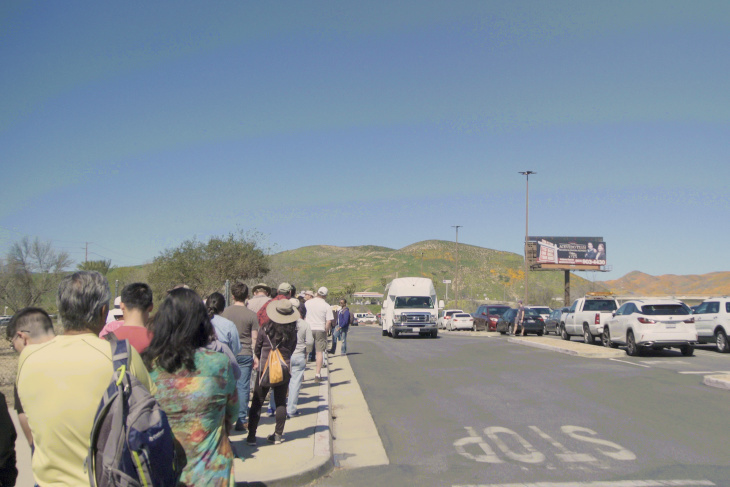 But by noon, Lake Elsinore Mayor Steve Manos had posted a video on Instagram to announce the poppy fields were completely full and asked would-be visitors to come back another time. Manos gave an explanation as to why the city reopened Walker Canyon saying they "don't have the resources to keep it closed," given the sheer number of visitors hell-bent on getting into the area. "We must remain flexible to this once in a lifetime opportunity and crisis facing our city," officials wrote in the caption. 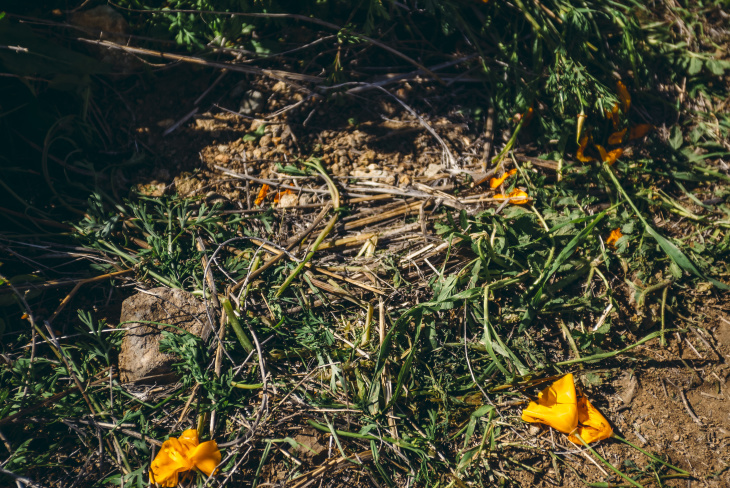 The exceptionally rainy winter brought us hillsides blanketed in bright orange poppies. It's beautiful, which means it's a photo op, which means tens of thousands of people are flocking to the poppy fields for their latest Instagram backdrop. It seems for some that the 'gram justifies the means, but it wasn't just the Insta-famous who weren't following proper super bloom etiquette. Many people who drove out to Walker Canyon left the marked trails to trample and pick the state flowers (we saw this behavior for ourselves). "The situation has escalated beyond our available resources," officials wrote Sunday in a Facebook post. "No additional shuttles or visitors will be allowed into Walker Canyon. This weekend has been unbearable (for) Lake Elsinore." City officials said some of their employees had been working "7 days straight and 12 hour days" and were "met with the worst kinds of behavior" from photo-hungry, flower-crazed crowds. Mayor Steve Manos posted a series of videos on the city's Facebook page Sunday to show residents just how overwhelmed city officials and police were by the "poppy apocalypse." "I don't expect this to be over here in the next week or two," Manos said. "I expect next weekend's going to be almost as bad as this one." Manos also said some of the porta-potties near trails were completely full and crews had not been able to get in to empty them because of the heavy traffic. The 15 Freeway was a crawl as drivers attempted to enter and exit from congested surface streets. Some drivers even parked on the freeway shoulder, onramps and offramps to walk to the nearby hills. On Monday, city officials said they would continue "to evaluate all possible options to reduce the strain on our community, the freeway, and local roadways" and were working on a new plan to address the expected swarm of people next weekend. "...we truly understand how difficult this natural phenomenon has been on our residents," officials said. "This is something unlike anything we have ever experienced in our City and may never again." 10:40 a.m.: This article was updated with news that Walker Canyon has been reopened. 12:35 p.m.: This article was updated with news that Walker Canyon is again at capacity. 2:29 p.m.: According to the Lake Elsinore City Hall facebook page, California Highway Patrol closed both the northbound and southbound Lake Street off ramps, which lead to the Walker Canyon trailhead.